It’s been 35 years since the woman who is now Sister Irini first came to Amorgos, the easternmost Greek island the Cyclades chain, a dry and craggy place that has a year-round population of around 2,000 people, a place she fell in love with when she was a young mother. That’s a different life now, far behind her as she said after her husband died she decided to stay on and build an oasis of a garden from an abandoned monastery, the attractions that lure visitors from around the world to the tiny dot in the Aegean. Her life was profiled by Terri Steel for The National Geographic, depicting the solitary sense being the only nun on an island where there are other monasteries but where hers stands out for its lusheness in a dry atmosphere. Seven years ago, Sister Irini – she won’t talk about who she was – began transforming a long-abandoned monastery into an oasis. Visitors come throughout the year to walk her bountiful garden lined with Byzantine frescos, to hear her story, and to purchase her magnificent paintings of religious icons, the report said. She lives the simple life of a nun, cloaked in black, tending the garden that has become a tourist attraction, welcoming visitors and talking of her life of faith. To get to it you trek up a hill on dusty roads, trying to avoid wandering goats. The monastery sits upon an ancient well, previously a water oracle where 17th-century water readers foretold believers’ futures through the blessings of St. George but the Church disapproves of that so a Bishop had the well cemented shut in 1967. 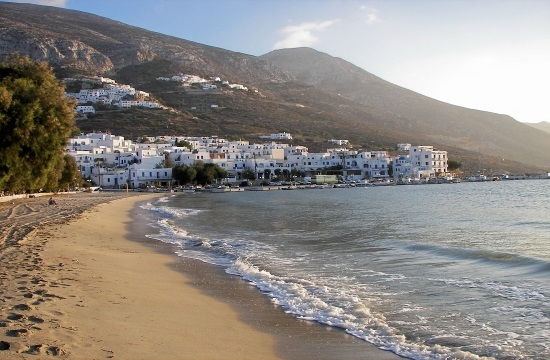 Life on Amorgos can be idyllic if you don’t want many modern amenities, including cash because the two ATM machines are often empty and residents barter among themselves for food and goods.